This bag!! Obsessed with the star detail – can’t believe it’s under $100! I love it paired with these pretty shorts! It makes for a perfect day-time combo. I’m obsessed with subtle pleating and the belt detail for an extra feminine edge. For a summery vibe, I added this straw tote (obsessed with the stars and also on sale under $100!) 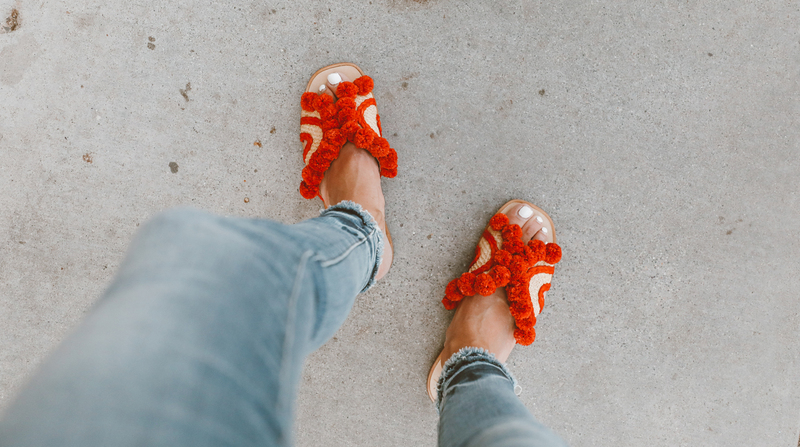 and these braided sandals – how pretty are they? This combo also makes for an easy to wear and picture perfect travel outfit. Another effortless way to wear stripes is with your favorite denim. I just got this pair for 30% off and love the fit! To keep it summer appropriate, I added these cute pom-pom slides (also on sale) and this white tote. I’m obsessed with white accessories for summer and so excited to use this bag this season! In collaboration with Saks Fifth Avenue. Those striped slides are just too adorable! <3 🙂 Loving this summery look! I’m loving these striped outfits! So cute! Dying over the stripes with those high waisted shorts. Total 50’s vibes and LOVING it! I love how perfectly the red stripes on the shirt match the sandals. Stripes are such a classic print. Great post! Both outfits are gorgeous, and I love how you styled each look differently. My favorite has to be the first look with the white shorts. Nice dress up looking , love your bag, It’s very attractive. Obsessed with those slides! Sooooo cute! I love these two styles! The looks look so cute. Such an awesome guide, had fun reading it. Thanks for sharing! I Love both looks. Stripes are such a Classic Look. Love both Looks. Stripes are super Classic and i wear them very often.